• Benjamin scored four touchdowns, three rushing and one receiving, in ASU’s 52-24 win over Oregon State on Saturday. • The sophomore set school records for most rushing yards in a single game with 312 yards, which ranks eighth all-time in the Pac-12, and the most in a half with 185 yards (1st half). He is one of three Pac-12 running backs to rush for at least 250 yards this year. • Benjamin’s 312-yard performance shattered the previous ASU record of 250 yards set by Ben Malone 45 years ago and is the most in the NCAA Division I FBS this season. • Added 27 receiving yards for the second-most all-purpose yards (339) in program history, falling just short of J.R. Redmond’s 350 all-purpose yards from 1998. • His rushing touchdowns went for 44, 47 and 10 yards and also scored on an eight-yard reception. Accumulated a double-digit total on 10 of his 30 carries against the Beavers (11, 44TD, 20, 21, 47TD, 15, 22, 23, 10TD, 19). •Amadi hauled in two interceptions, including a pick-6 in the fourth quarter, and recorded seven solo tackles in Oregon’s 42-24 road win at No. 24 California for its first win in a Pac-12 road opener since 2015. • His interception return for a touchdown was his second of the season and his third-career touchdown, while seven tackles tied his career high for the most by a Duck this season. 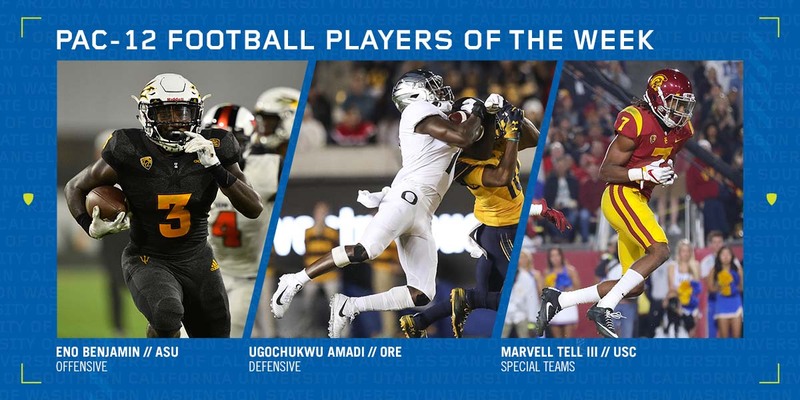 • Amadi is one of seven FBS players with seven or more tackles and two interceptions in a single game this season and is also one of only three players with two interceptions returned for touchdowns in 2018. • First Oregon player with two interceptions, including a pick-6, in a Pac-12 game since Ifo Ekpre-Olomu in 2012 against Arizona. • Tied for second nationally with three interceptions on the season. Also nominated: Malik Lawal, LB, ASU; Drew Lewis, OLB, COLO; Alijah Holder, DB, STAN; Corrion Ballard, S, UTAH; Peyton Pelluer, LB, WSU. • Tell blocked a 38-yard field goal attempt at the end of the first half, points that could have been crucial in USC’s 24-20 victory over Arizona. • As the starting free safety, Tell also had four tackles, including one for a loss, and grabbed USC’s first interception of 2018.